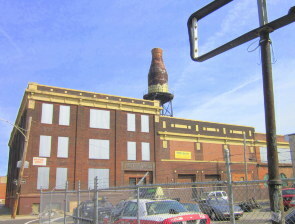 The former Harbison's Dairy complex and its large dairy milk bottle water tower is found on the 2000 block of East Dreer Street in East Kensington. 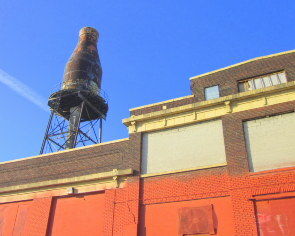 If you ride the Market–Frankford Line, look out the window between the stations of Berks and York Dauphin and you will see the tall milk bottle. 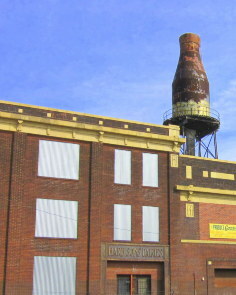 The Harbison Dairy closed in the mid 1960s. 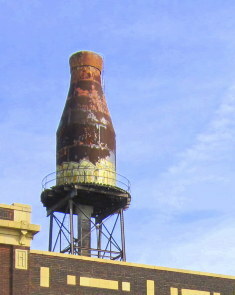 However, the Harbison milk bottle water tower remains a prominent landmark for this neighborhood. When Harbison Dairy opened in 1865, milk trains from the farms would bring the fresh milk to the Dairy. In 1904, Mr. Harbison spoke at the proceedings of the annual meeting of the Pennsylvania Dairy Union regarding the cost of milk and the cost of delivering milk two times a day. 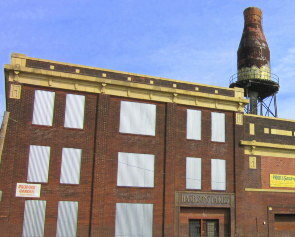 Refrigerators were not used in the home until the late 1920's. As a young child, I remember drinking Harbison Milk that was delivered to the door step. I do not remember the horse drawn milk wagons. In the late 1950’s, my milk man drove a white and red truck. 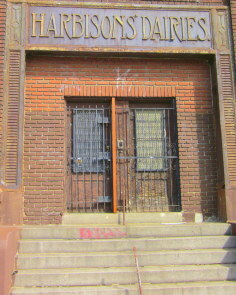 I remember the sounds made from the glass milk bottles being carried in a metal tray to our front door steps. I remember my mom telling my brother and me to “get the milk” as soon as it was delivered. My mom did not want anyone taking our milk. There was a poor family across the street who had many children and sometimes the eldest son would take the milk off his neighbor's steps. About 30 years ago, my brother and I were hired to restore the plastered walls in a huge old home on West Susquehanna Ave, a house on Norris Square Homes. 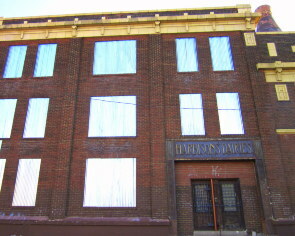 The house was the former home of the Harbison family and was within walking distances from the Dairy. The house was so beautiful inside: decorative plastered ceilings moldings; stained glass windows; and wood work made from chestnut, oak and walnut woods. A Grand Old Philadelphia home on the Norris Square.